Blacks and whites are the most misunderstood. Though the shades in a palate can only be attributed to the proportion of #blackandwhite mixed by the artist, the degree of contrast in a single frame is often judged as the amount of light an object can reflect. There’s always enough light to create a bright image. What to see in it lies in the eyes of the beholder – the blacks, the whites, the greys, even the paradoxical presence of objects that are often hiding. 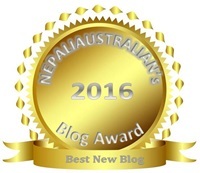 Best New Blog 2016 Award!